Wrought iron balconies line steep narrow cobblestone streets; collections of art, museums, plazas, parks, theatres, monasteries, and 90 churches dating back to as early as the 15th century. Ecuadorian colonial art combines the European Renaissance and Baroque styles with Indigenous and Mestizo influences. Quito's birthday is celebrated in December with bull fighting fairs and flamenco shows. So much to do, so little time ! 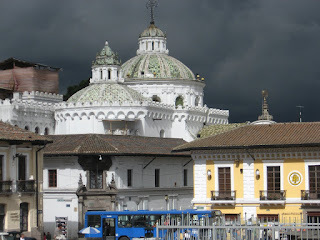 I am sure we would all love to have six months to explore Quito, and its surrounding regions. About 7 hours away from our coastal ciudad of Bahia de Caraquez it is the arrival destination for most visitors to Ecuador, and the centre for the country's commerce & business. We have now visited numerous times and compiled our adventures. We enjoy visiting the busy metropolis for the richness in culture, diversity of ethnic cuisine, and the energy of the people. Join us in exploring the streets, plazas, churches, shops and bustle of 2.5 million residents of the largest historic centre in the Americas. Where open air, old-fashioned wooden buses troll the streets as "rolling musical parties" known as "chivas" Live bands and canelazo ( a warm fruit juice liquor ) are provided. 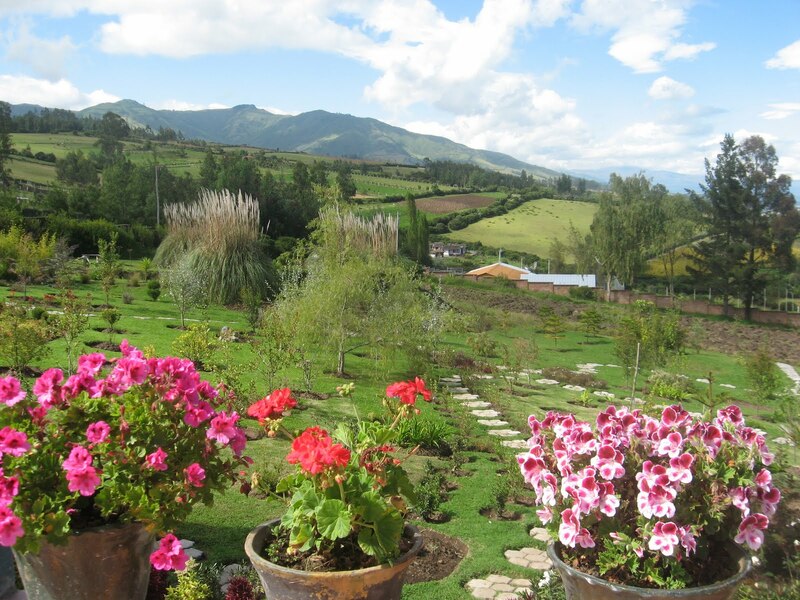 Situated on the equator west of the active Pichincha volcano ( 15,000 ft ) within the Andes at an elevation of 9,200 feet its climate is always "spring like." To the east is Antisana ( 18,700 ft )and Cayambe ( 18,725 ft ) to the north. The latest volcanic eruptions were just days after our most recent visit, when on May 28th to June 1st Tungurahua ( 16,479 ft ) erupted violently with five to ten explosions per hour, created puffs of smoke, large amounts of ash, lava flows, and incandescent bombs & projectiles. Surrounding villages on the mountainside and base and nearby Banos were evacuated. Today it continues to rumble with minor activity. The largest eruption occurred in 1660 when more than 10 inches (25 cm) of ash covered the city. There were three minor eruptions in the 1800s. Experts report that it is unlikely that any serious activity will occur in the near future, and the topography of the volcano is such that, even if a major eruption were to occur, lava flows would head into the almost-unpopulated areas west of the volcano, sparing Quito, which lies to the east. A wonderful setting as an astronomical observatory, it is divided into three major areas separated by hills - central Old Colonial Town; the northern La Mariscal Sucre a modern commercial hot spot known as "gringolandia" with an international mecca of coffee shops, restaurants, boutique stores & hotels; the southern industrial and working class residential area. Quito hosts over 8 million visitors each year. A little history - Shyris were the original organized civilization followed by the Incas in the 15th century. The Spanish arrived in 1534 and under the direction of Sebastion de Benalcazar conquered the city. The Spanish established Roman Catholicism in Quito. The Spanish actively converted the Indigenous population and used them as forced labor for construction, especially in the early colonial years. In 1809, after nearly 300 years of Spanish colonization, Quito a city of about 10,000 inhabitants started to seek political independence from Spain. On that date, a plan for government was established that placed Juan Pío Montúfar as President with various other prominent figures in other positions of government. However, this initial movement was ultimately defeated on August 2, 1810, when Imperial troops came from Lima, Peru, and killed the leaders of the uprising along with about 200 inhabitants of the city. A series of conflicts concluded in 1822, when Antonio José de Sucre, under the command of Simón Bolívar, led troops into the Battle of Pichincha. Their victory marked the independence of Quito and the surrounding areas. In 1822 after the Battle of Pichincha the leaders of the city proclaimed their independence and annexed to the Republic of Gran Colombia. 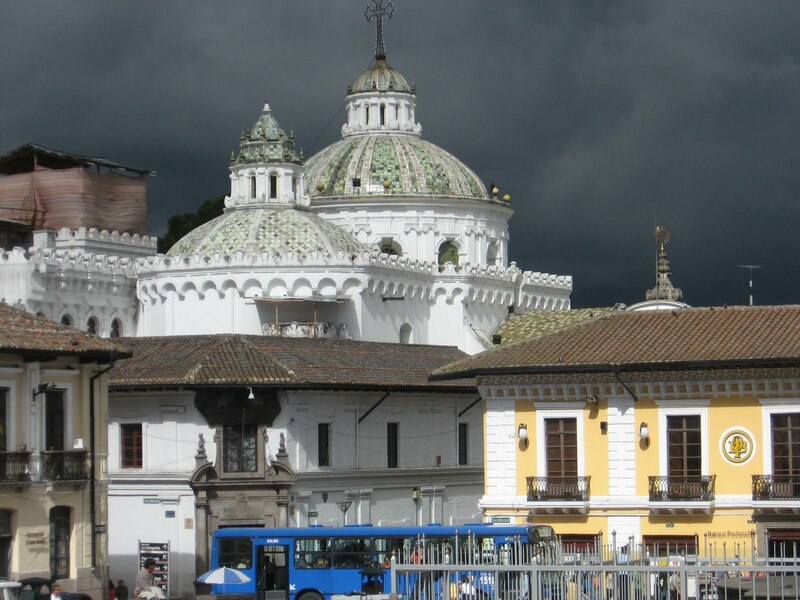 When Gran Colombia dissolved in 1830, Quito became the capital of the newly formed Republic of Ecuador. The Roman Catholic Diocese of Quito was established in 1545 and was elevated to the Archdiocese of Quito in 1849. 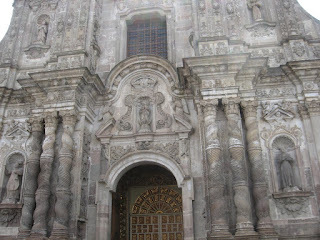 In 1535, the San Francisco Convent was constructed and provided Quito's official name. and the main altar holds the original masterpiece sculpture of La Virgin de Quito. The cobblestone Plaza was originally a bustling commercial centre hosting the trade of surrounding populations. Adjacent to the church is a museum housing an art collection of famous paintings, sculptures, and period furniture. Strolling along Calle de La Ronda, one of the city's flagship regeneration projects, you will discover traditional colonial life in Quito. A narrow, winding street lined with artisan galleries, candle-makers, hat-makers, craft shops and lots of cafes. The street is home to and has inspired numerous musicians, poets, and historians. Construction of the Iglesia de la Compania de Jesus started in 1605 and took the Jesuits over 160 years to build. A Latin Cross design, it is one of the richest churches in the Americas . It is a Latin American baroque style with a facade of volcanic grey stone and Solomon Pillars. In the interior, literally every inch of the altar-pieces, the chapels, the columns and the dome of the transept, the choir and the tribunes is filled with sculptures and ornate carvings of angels, foliage, vines, fruits, birds and caryatids decorated with seven tons of 23 kt gold. Basílica del Voto Nacional is the newest and largest church with stunning views. and stain glass windows of orchids. Underneath the church is a large cemetery. It's towers are 78 meters high, and the Basilica is 150 meters long. You are able to ascend the towers and cross a catwalk above the church ceiling for some fantastic views. The Basilica can be seen from almost everywhere in the city, particularly at night when it is illuminated in bright green and blue. Archbishop's Palace, Metropolitan Cathedral, Municipal building, and the monument to Liberty. The Metropolitan Cathedral built in 1562 to replace a humble mud and straw church built 30 years earlier. It is an Orthodox style building, and is considered the oldest cathedral in South America. Its walls and domes have witnessed all the important events in the capital. Hidden behind a fabulous facade, is a baroque masterpiece, the gold leaf ceiling creates a penumbra. A resting place for leaders and a place of devotion to the heroes of Independence, the Cathedral is full of secret histories. Engraved plates line the outer walls honoring the parents of Independence. The Cathedral is an intriguing fusion of forms: Gothic arches lead to a Moorish ceiling, while the chorus is adorned with neoclassical episcopal chair, surrounded by colonial sculptures Caspicara. And the three ships are clearly baroque. Among this mix of styles, one is also a story of life in the priesthood in the seventeenth century choral books, silver objects were left by the parishioners and the robes worn by priests. The Dominicans came to Quito in 1541, building the Santa Domingo Iglesia under the guidance of Francisco Becerra, the Spanish architect. Work was completed in the first half of the seventeenth century. There is a separate chapel beside the church itself, dedicated to Our Lady of the Rosary. Both the church and the chapel are finely decorated, with altar pieces, statues and paintings. The chapel of the Rosary is another matter it has an exuberant rococo altar piece decorated with golden figures against a scarlet background, columns with intermingled leaf and anthropomorphic designs, complicated pediments - all of which goes to make up a decorative whole of unusual complexity and beauty. Quito, although a major metropolis, has maintained "green space for people" with several major parks. Given the city traffic smog and noise, bustling pedestrian streets, and the altitude they are a welcome solice. Parque Metropolitano, in northern Quito behind Estadio Olimpico, is the largest urban park in South America at 1,376 acres ( in comparison New York's Central Park is 843 acres ). The eucalyptus forest park is used for mountain biking, walking, and running. La Carolina is a 165 acre park in the centre of Quito main business area surrounded by tall buildings. Quiteños gather at La Carolina mostly on weekends to play soccer, basketball, volleyball, fly kites, run, use an excellent skateboard park, snack, and people watch. We collected seeds and enjoyed some rare tropical plants & flowers in the Botanical Gardens located inside Parque La Carolina. They boast over 1200 species of orchids along with many other unique flora to Ecuador. On another occasion we enjoyed a stroll through artisan displays and performances and a leisurely peddle-boat cruise on a figure eight lagoon. El Ejido divides the old part of the city from the modern one. This park is known for handicrafts available for sale every Saturday and Sunday, with all pricing subject to negotiation ! Local painters sell copies of paintings by Oswaldo Guayasamín, Eduardo Kingman, and Gonzalo Endara Crow. Otavaleños sell traditional sweaters, ponchos, carpets, and jewelry. A long triangular shaped park of La Alameda is located where the historic centre begins. It has an impressive monument of Simón Bolivar at the apex. In the centre of the park is the oldest observatory in Latin America, which was opened by President García Moreno in 1873. It is used for both meteorology and astronomy. Casa de la Cultura complex or the National Museum of Ecuador has for the last six decades protected Ecuador's cultural heritage with the country's best and most extensive collection. It consists of five thematic rooms. The archaeology room holds artifacts from 12,000 BC - 1534 AD of the first permanent inhabitants in Ecuador. The Gold room ( 500 BC - 1534 AD ) unveils the legacy of pre-Columbian metalwork - masks, pendants, emblems and ornaments. The Colonial Art room holds an art collection, heavy religious and Spanish influence, from the different movements and artists from 1534 - 1820. The Republican Art room contains art after the colonial period to 1944 , affirming national identity. Lastly we find the Contemporary Art room representing the globalization, modernization and swift changes experienced in the second half of the twentieth century. Mercado Artesanal de la Mariscal where there's a huge array of handicrafts and souvenirs on sale in over 100 colourful stalls. 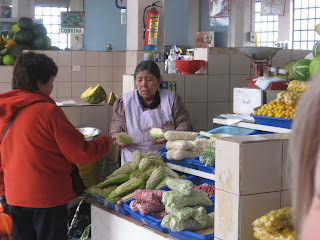 If you do not have a chance to visit Otavalo's Indigenous market this is a good alternative. The Capilla del Hombre (Chapel of Man) houses the Ecuadorian painter Guayasamín's inspiring collection of canvasses. A ride up the Teleferico cable car ascends another 4,000 feet to 13,487 feet for a stunning vista on a clear day. It's best to visit early in the morning for clear views of the Andes. 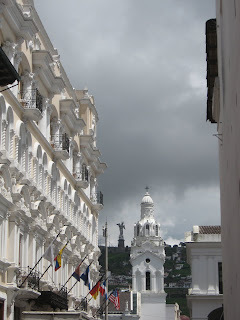 A little mound of a hill that hosted a lot of historical events is now marked with an aluminum statue of the Virgin de Quito overlooking the city and is known as El Panecillo. In the area of the capital is the Middle of the World complex (Ciudadela Mitad del Mundo) , which marks the spot where the Equator crosses the Andes, It's a fun and educational complex however controversially located and built for tourists. The original Incan sundial for the Mitad del Mundo is some kilometres away and is shown here. Mariscal Sucre International Airport (UIO) is the city's principal airport for passenger travel and freight. Because of tall buildings and fog at night, landing from the south is not as easy as at many other airports. The airport provides international connections to Madrid, Amsterdam, New York, Miami, Bogotá, Cali, Lima, Santiago, Panama City, San José, Rio de Janeiro, São Paulo, and many others. Currently there is not a direct flight to Canada which is somewhat ironic in that a Canadian company is constructing the new airport scheduled to be finished by 2011. The original Mariscal Sucre International Airport will then become a big park. North of Quito to the border of Columbia is a region famous for it's artesans. Countless villages specialize in their own particular craft, textiles, hats, woodcarvings, or leather goods. It is the region for the market town of Otavalo. This is the largest handicrafts market in South America, with a huge array of crafts on sale, particularly textiles made in the surrounding region. The busiest and largest days are Wednesday and Saturday, but the market takes place every day of the week. In fact to avoid the tourist crowds we prefer the weekdays. 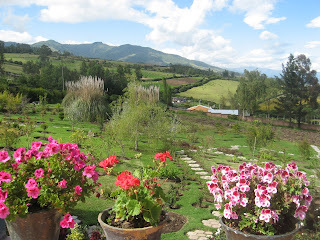 There is lovely countryside all around Otavalo, great for exploring, hiking, horseback or mountain bike. East of Quito, the eastern cordillera of the Andes rises up before descending to the Amazon basin. The little-explored region of Papallacta, San Isidro and El Cato, is rich in diverse ecosystems, ecotourism opportunities and some delightful hotsprings for relaxation. 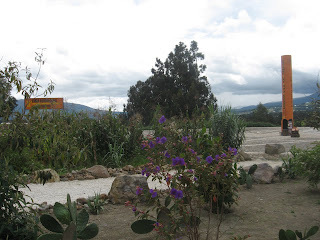 We traveled south of Quito through a national park and the avenue of volcanoes. An agricultural valley flanked on both sides by active volcanoes. Cotopaxi soars nearly 6,000 metres (19,000 feet). The ideal place for adventure sports such as mountain biking, mountain climbing or trekking. Haciendas offer superb hospitality and some great horseback riding. At the highland city of Latacunga we turned west climbing the Cotopaxi volcano. The countryside had colourful villages, agricultural patchwork fields, and many sheep. Reaching cloudy & foggy elevations in which our vehicle was not running well, the air was fresh and cold, and the vegetation sparse. The Indigenous families here in the high paramo lived in thatched earth sheltered homes to protect them from the elements. Running water and electricity are not present. South of Zumbahua we turned to Quevedo for a spectacular ride. There is a circuitous route known as the Quilotoa Circuit which loops back around Cotopaxi to Latacunga. It was grand scenery along a mountainous road in the rainy season. Unfortunately the fog and rain prevented more photos. Often when rounding a corner most of the road had been misplaced down the hillside, a grueling narrow twisting trail filled with mud and water became normal for many miles. We encountered very little traffic traversing both up steep mountainsides and again down, we passed through Angamarca and El Corazon, on one of the most beautiful routes connecting the highlands with the coast. As we return to the coast we pass through cloudforests which drape the western cordillera of the Andes as it tumbles down to the Pacific. The area, usually called Mindo is a fantastic place for adventures in nature, and a paradise for birdwatchers and butterfly enthusiasts. 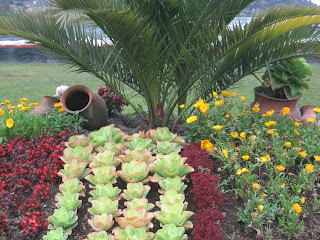 Ecuador " Life at its purest " a fitting description for the vast natural beauty !